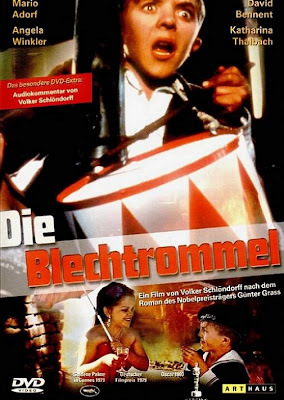 The Tin Drum is a film directed by self-loathing German New Waver Volker Schlöndorff and adapted from the novel of the same name by Günter Grass. A few years ago Grass finally came clean about his service in the Waffen-SS, one of Germany’s most brutal killing machines, and international pansies were unanimously outraged. It seems that the literary world was furious when they found out they were “tricked” into liking novels written by a Nazi butcher. 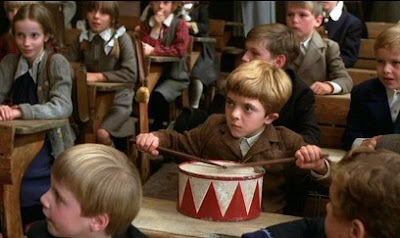 Despite Grass’s very anti-Nazi novel The Tin Drum, the art fag and vain altruistic crowd may never forgive him. Schlöndorff's The Tin Drum is one of the greatest masterpieces of German New Wave cinema. The film shared the 1979 Cannes Film Festival Palme d'Or with Francis Ford Coppola’s Apocalypse Now. Like Apocalypse Now, The Tin Drum combines real wartime drama with fantasy elements. Although I had considered Apocalypse Now one of my favorite films for a good portion of my life, I now consider The Tin Drum (among other European war films) a much superior film. The world of The Tin Drum is a much more distant and dark world than Apocalypse Now could have ever hoped to be. The Tin Drum mainly focuses on the time period before the rise of the Nazi party and the eventual destructive fall of Germany. On his third birthday, Oskar has decided he has contempt for the adult world and vows to never grow up. On that some birthday, Oskar receives a tin drum which he bangs on in an act of defiance against all that he hates (especially Nazis). He also has the ability to break glass with his girly high pitch screaming. One things is for sure; little Oskar is one disturbing little turd. I must say that I don't care much for the character of little Oskar. He lacks any type of rationality and unintentionally leads his family into harmful situations. I almost felt cheated when the young chap survives the war at the end of the film. I was hoping some large building might topple over Oskar and his wretched drum. He never really learns how to play it. I`ve never seen this film but i know how legendary it has become over the last 30 years so i dont understand why you only allocated 4 short paragraphs to it?, before and since you`ve regularly allocated 4, 5 or even 10 times as much space and effort into reveiwing films that have no-where near the levels of magnitude that this movie obviously has, i would have also thought that this would be exactly the kind of film that you would enjoy applying your intellectualism to, perhaps you could reveiw the film again, only this time with a bit more of the traditional Noam Chomsky personae (as it were). Cheers geezer, i`ll look forward to reading that all new perspective on this legendary movie. Its 4 months again and the promised all-new improved reveiw of "The Tin Drum" still hasn`t materalised ! ? ! ?. Can anybody help me to identify the german songs of the 1930's or 1940's that briefly, for a few seconds, played in this film ? I am having no luck with the internet search.